iSanook i Bangkok, Thailand : Boka nu! Looking for a stylish and comfortable place to stay? iSanook residence is waiting for you! If you like shopping at Siam Paragon and Central World are close as well. For those who prefer to spend time with us at iSanook can work out in our gym, relax in the Jacuzzi, take a bath in the outdoor swimmingpool, enjoy good food in our rooftop restaurant and watch the sunset with a delicious cocktail at our Roof Top Bar. The iSanook reception team is there for you 24 hours a day. Our security system with CCTV, key card entries and security guards will keep you safe at any time of the day. At iSanook, we create our own standard of fun and comfort. 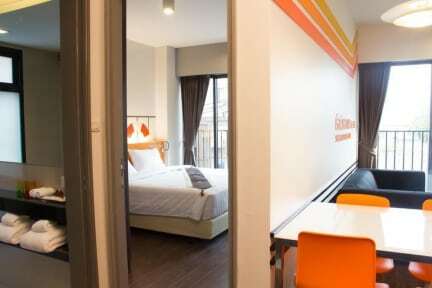 Our 3 different room themes will allow our guests and friends to experience with essence of Thailand. iSanook 's rooms design will enhance your fun time in the city of Angels. We are looking forward to welcoming you soon here at iSanook!